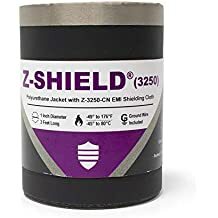 Hook N Shield Shx4 - Emi Jackets And Expandable Sleeves - Emi Shielding - Products - ZT | Zippertubing Co.
0.5" 0.625" 0.75" 0.875" 1.0" 1.125" 1.25" 1.375" 1.5" 1.625" 1.75" 1.875" 2.0" 2.125" 2.25" 2.375" 2.5" 2.625" 2.75" 2.875" 3.0" 3.125" 3.25" 3.375" 3.5" 3.625" 3.75" 3.875" 4.0"
Zippertubing's Hook-N-Shield® is an easy to use and convenient way to provide a wide range of protective jacketing with the added benefits of EMI/RFI shielding protection. The Hook-N-Shield® family is comprised of many variations of extruded films and coated fabrics combined with one of our shielding materials and a Hook-N-Loop closure. 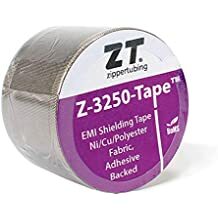 This field installable and easy to re-enter jacket is perfect for any installation where frequent access is required, but accessibility for any additional tools may be limited. Cable Diameter 0.5" 0.625" 0.75" 0.875" 1.0" 1.125" 1.25" 1.375" 1.5" 1.625" 1.75" 1.875" 2.0" 2.125" 2.25" 2.375" 2.5" 2.625" 2.75" 2.875" 3.0" 3.125" 3.25" 3.375" 3.5" 3.625" 3.75" 3.875" 4.0"